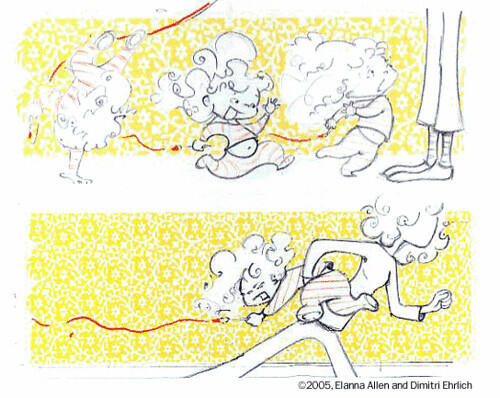 The Frederator Studios Blog: Elanna Allen & Dimitri Ehrlich. I produce cartoons, TV networks, and records. Last Chance! 5 days left! Bill Burnett & Jaime Diaz. Oh Yeah! Last chance! 10 days left. My heroes. Postcards, Series 5. Elanna Allen & Dimitri Ehrlich. Elanna Allen is an animator and artist and Dimitri Ehrlich is a writer. Together they came in with a very nice, fun, picture book called Captain Fun and Tiny Special Pants for our Bolder Books for Boys & Girls project with Random House. Thanks to Elanna & Dimitri for kind permission to post am illustration from their book.